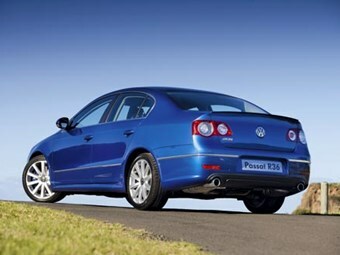 Volkswagen first introduced the R-series performance moniker here in 2004 with the Golf R32 hot hatch. The R32 was joined by the potent Touareg R50 SUV last year and more recently by the mid-size Passat R36 sedan and wagon. The R line performance models, according to Volkswagen Australia chief Jutta Dierks, are designed to get buyers more excited about the brand and add 1000 extra sales in 2009. So what does R stand for? In the case of the new R36 Passat "rip-snorting" immediately springs to mind for this is the most potent model in the model’s 34-year history. Created by Volkswagen’s Individual performance division the R36 – the nomenclature is derived from engine size – comes with a 3.6-litre direct injection V6 producing 220kW and a lustful 350Nm of torque. Only one transmission is available – VW’s acclaimed dual-clutch six-speed DSG automated manual and it benefits from paddle shifts. Final drive is via the company’s 4Motion all-wheel-drive system used in a number of models. It’s no slouch with the sedan reaching 100 clicks in 5.6 seconds with an electronically controlled top speed of 250km/h. The heavier wagon is just two-tenths slower to 100km/h. Essentially a front driver until slippage is detected at which point the drive is also directed to the rear wheels via a Haldex clutch, the VW’s system is well proven and the transition from two to four-wheel drive is all but seamless. Visually, the Passat is bold and seductive – special bumpers with enlarge air intakes on the front, a matte chrome finish radiator grille with slatted air inlets, a tasteful boot spoiler on the sedan, high level roof edge spoiler on the wagon and chrome dual exhaust pipes leave no doubt that this is an R-rated Passat. Colour-coded wheel arch extensions over 18-inch alloy wheels shod with 40-series tyres give it a purposeful appearance; more classy than boy racer. Darkened rear tail light clusters and a body side sill extension complete the package. The visual effect is enhanced by a 25mm lower ride height, the sports suspension gaining tauter springs and dampers and vented disc brakes all round – 345mm on the front, 310mm on the rear. It’s important to realise when you drive the R36 that it is nearly $10,000 dearer than the 3.2-litre V6 FSI 4motion model, a car no slouch in its own right. Admittedly, the luxury car tax has added $600 to the R36 models since August but nevertheless they’re starting to get into serious pricing territory. So you would expect them to be very polished as well as fast and they don’t disappoint, although the 35-series tyres on our average roads endow it with average ride quality. Sports seats give the interior a distinct performance feel, as does the combination of quality cloth and leather, white instrumentation, alloy pedals and gear selector and special R36 door sill trims. It may not suit the really hard nosed performance buffs but the R36 is nevertheless a welcome new addition although we can’t see them being as popular as the R32 Golf.